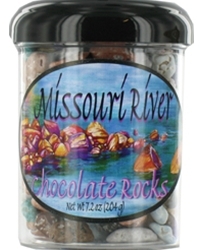 These dynamically colored rocks are made by layering several coats of gourmet milk chocolate. This candied shell make them look like river rocks. They look cool and unique and taste like these famous candies that only melt in your mouth. Packaged in our 7.2 oz jar, they have been a best seller for over 10 years. The chocolate Rocks are also available in black or gold mixes.